Inflammation is the body’s natural reaction to physical trauma, be it a cut on the finger or a minor infection of some kind. When our bodies are injured, they often begin to try and stave off further injury and infection while working to repair the damage done. One of the ways in which our bodies heal is via inflammation. When we sprain an ankle, for example, the area around the injury tends to become “stiff” and painful. Inflammation is often one of the causes of this discomfort – but that doesn’t mean that it is inherently bad. In fact, inflammation is referred to as a “protective” response of the body when it has been injured, and it works to help repair the affected area. Once the injury has been resolved, the inflammation goes away. In this way, inflammation is a natural occurrence that usually works to help keep us healthy. Unfortunately, sometimes inflammation doesn’t fade. Sometimes it doesn’t even appear to be a response to a specific injury! Chronic low-level inflammation, also known as systemic inflammation, is used to refer to a state in which the body is almost always in a state of inflammation. This can have significant negative effects on our health and has been associated with depression and other mental health conditions. Source: Kiecolt-Glaser, J. K., Derry, H. M. & Fagundes, C. P. Inflammation: depression fans the flames and feasts on the heat. Am. J. Psychiatry 172, 1075–1091 (2015). If depression, disturbed sleep, poor diets, and sedentary lifestyles are not properly addressed, they could lead to even more serious inflammatory responses. In fact, they could ultimately lead to a vicious circle of depression and inflammation, meaning that the two health issues run rampant and feed off of each other. 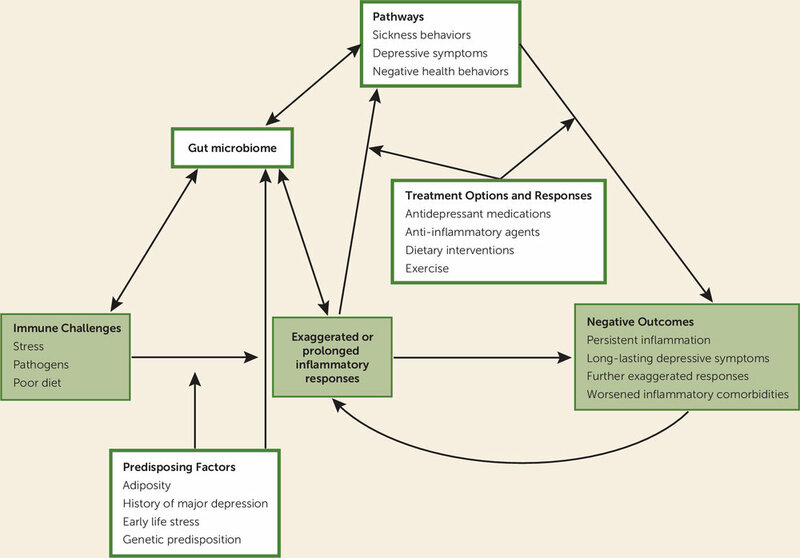 With all of that said, does the link between inflammation and depression that is present in some patients mean that treating depression is as simple as treating the inflammation that might be causing it? Well, not quite. What recent studies have indicated, however, is that treating inflammation might be an effective part of a comprehensive treatment plan for depression. In one recent study Inflammation and depression: combined use of selective serotonin reuptake inhibitors and NSAIDs or paracetamol and psychiatric outcomes published in 2015 in the journal Brain and Behavior, 17.5% participants out of 123,351 reported using nonsteroidal anti-inflammatory drugs (NSAIDs) while 8.3% reported using paracetamol (Tylenol) concomitantly. By analyzing the participants taking NSAIDs concomitantly with the antidepressants in question, it was possible to glean a few trends. In general, low-dose aspirin was shown to reduce psychiatric contact (visits to psychiatrist, psychiatric ER, inpatient hospitalization, etc. ), both in general as well as with depression specifically. These results led researchers to conclude that the use of low-dose (81mg) aspirin or other anti-inflammatory agents might be an effective adjunctive to antidepressants. The findings of the study discussed above are reinforced in yet another piece of research. This study looking at the effects of omega-3 fatty acids, cytokine antagonists, exercise, and celecoxib in patients with depression, shows that anti-inflammatory treatments have a heightened impact on the mood of patients suffering from chronic inflammation. That means that treating the inflammation in these individuals did have a positive impact on their moods, and therefore it might be beneficial to consider treating both depression and inflammation when they co-occur in patients. Doing so could actually speed up their recovery while also serving to lower their chances of experiencing a recurrence of depression. In conclusion, inflammation seems to be common in individuals suffering from depression. In these patients, taking the time to treat both their heightened inflammation as well as their depression could lead to a faster recovery and better treatment results. And while this doesn’t necessarily mean that all we need to treat depression is a baby aspirin a day, it does indicate that taking a baby aspirin could have a positive impact on your mood should you also be suffering from heightened inflammation.